3 Woodland Mansions near spawn seed for Minecraft Xbox One! Perfect if you are looking for lots of Woodland Mansions to explore. You spawn by 2 mansions which are super close together, and then in the top corner is another one. I include cords below which also include the location for a Witchs Hut, Podzol, Pumpkins, and even an igloo. Unfortunately my igloo didn't have a basement but maybe your's will! If not its still a great place to rest for the evening as your passing by. Check out the video below to see what the seed looks flying over right from spawn to all of the goodies on the map. I even show you the map view so you can see what kind of biomes exist and where on spawn. 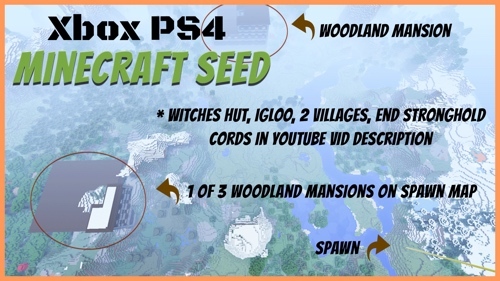 If you like this 3 Woodland Mansions near Spawn seed for Minecraft Xbox One then subscribe to my youtube channel to keep updated on the latest seeds that I find. Happy Crafting!